Australia’s capital city Perth is the largest city of the Western State of Australia and is home to around 1.5 million people. It was originally founded as the political centre for the Swan River free settler colony in 1829 by Captain James Stirling. Perth Airport lies a little outside the main city of Perth. Nine miles to the north east in fact. It is the 4th busiest of Australia’s airports, and provides both domestic and international flights. Because Perth is a popular place to travel to, there are over 50 different airlines that fly here meaning that for people who are searching for deals, there are often some excellent deals to be found. One of the best ways to do this is via online flight finders such as netflights.com Travel between the airport and the city is easy with plenty of choice in airport shuttle busses, taxi services and hire cars, and the journey only takes about 30 minutes. 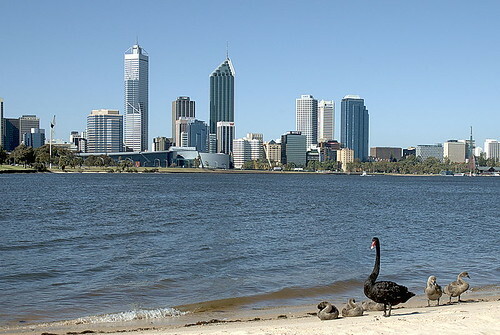 Perth city and most of its suburbs lie on the Swan Coastal plain between the Darling Scarp and the Indian Ocean and the Swan River is a major element of Perth City. Many people living here enjoy a lifestyle that includes activities on or near the water including things such as wind surfing, yachting and sun bathing. The river has lots of excellent paths for cycling too, and many cruise ships visit Perth as the climate here is excellent being a blend of Californian and Mediterranean. Perth has excellent beaches which are patrolled and where they post flags to show safe swimming locations. These beaches are often full of beautiful sand and are well tended and looked after. One of the best known and easiest to access via public transport is Scarborough beach. In Perth’s city centre, there is a really interesting mixture of buildings. Modern glass and steel high rise buildings can be found side by side with Colonial period buildings, and this gives Perth a feel that’s quite different from many cities. The centre of Perth is quite compact and its ‘free transit zone’ means that travel on buses and trains of the central area transit system are free. The main business and shopping districts are connected by numerous walkways making walking easy and common. The best known streets within the shopping area are Murray and Hay Street where lots of arcades, malls and department stores can be found. One of the most noted Malls is London Court with its Elizabethan street façade and it’s replica of Big Ben. Northbridge is probably the area best known for city nightlife, and there is quite a wide range of bars, clubs and pubs here as well as plenty of restaurants and other eateries. Lots of people like to enjoy alfresco dining and many of the street and waterside cafes offer outdoor seating areas where you can enjoy a mixture of different foods from around the world including Chinese, Indian, Japanese, Malaysian, Italian, Polish and more. One suburban café in Perth has been awarded the title of world’s best gourmet pizza maker. Locally caught seafood is also often on the menu.